A pretty cool film noir that is routine and simple in it’s first half, but really picks up after that. 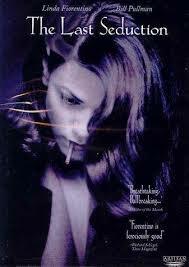 The Last Seduction is a very interesting and entertaining film noir. It has a lengthy setup that clocks in at nearly an hour, but that’s all in the interest of making us care and understand who these characters are and what they have been through, before things really get going. The movie is about a woman who runs away with a large sum of money (just like Psycho), trying to escape her past. She ends up in a small town, with a nice guy taking her in and starting up a relationship with her. It’s in the second half of the movie that this woman, Bridgette (Linda Fiorentino), starts to go to work on the guy, figuring out how to use him for murder. There’s a lot of double indemnity mixed into this movie, and that works out pretty well. Especially when we get to the climax, which is loaded up with cool twists. the setup is long, but the payoff is rewarding. The Last Seduction is a movie that rewards patience. it’s a John Dahl-directed film with a great title, and those two things both work in the movie’s favor. so does the fact that it casts Linda Fiorentino as the star, a woman who was born to play the femme fatale of a classic film noir, like she does here. John Dahl was just coming off his best movie, red rock west, also a film noir. the last Seduction is also one of his better films and takes a backseat only to red rock and Rounders, which came out four years later. after that, Dahl kind of lost his way as a director, but this movie will always be his most well known film. It’s a sort of black comedy, set in the world of noir with a woman getting a man to kill her husband, double indemnity-style. Only it takes a while to work up to that, and there’s a whole lengthy storyline that precedes it. At the start of the movie we are with Bridgette (Fiorentino) and her husband, Clay (Bill Pullman), as he makes a deal with some drug dealers, to sell them a large amount of prescription pills. Clay meets them underneath a bridge and returns home with a suitcase filled with money. Bridgette says the wrong thing to him, and clay ends up smacking her across the mouth. then he goes to take a shower and Bridgette takes the money and skips town. she has had it with her husband, and this is probably something she had been planning for some time. the smack across the mouth, was just the final straw. she ends up leaving Manhattan and driving all the way to Buffalo, New York. 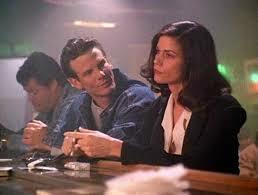 here, she stops at a bar, and meets a nice young man who gives her reason to stay in the town. The man is Mike, played by peter berg. when Bridgette steps into the bar, she is rude to the bartender, and seems to have an attitude across her face. Mike tries to befriend her and gets her a drink, only his generosity doesn’t go over so well. It takes him being gutsy and taking a gamble, by saying something risky to Bridgette to actually get her attention. suddenly she’s feeling him up at the table and then going home with him. She has found her target. The first hour or so of the movie is the setup. it’s all about Bridgette (who has changed her name to Wendy Kroy), and Mike. She doesn’t have her plan all worked out at first, and doesn’t know if she’ll be seeing Mike again. Then he ends up working in the same building as her, and she suddenly realizes how far she can push things with him in order to get what she wants. Now she begins playing him, weaving her web around him, and getting him to fall for her. All the while, back in New York, clay is trying to find Bridgette. He hires a private detective, (Bill Nunn), to take the case, offering to split the money that Bridgette stole with the detective, fifty-fifty. This guy is able to pin point which town Bridgette is in, and even finds her house, but once the two of them get side by side in a car, she is just too clever for him. As with Mike, Bridgette uses her sexuality to get the better of this detective, and the next thing you know, she has eliminated the problem. What happens to the detective is the exciting scene that leads us into the second half of the film. This is where things really start to pick up. Mike tells Bridgette about how as an insurance claims adjuster he learns a lot about people’s lives and the problems they have. He tells her about a woman who has happy her husband died because he had multiple credit cards that he was giving different women access to. This is where Bridgette has the idea that they can start a service where they kill cheating husbands for women who are willing to pay for it. The whole thing is ridiculous, but it is certainly interesting and different. This gets taken even further when Bridgette convinces Mike that she has gone through with the service and has killed people. Mike believes her and wants no part of it. He separates himself from Bridgette after she asks him to kill for her to make the two of them even. Mike refuses and leaves Bridgette, but then she comes up with a clever idea to get him back, involving bringing something back from Mike’s past. There are some great twists in the final portions of the movie. Of course Bridgette’s plan the whole time has been to get Mike to kill her husband, back in new York, only there are a few complications that rise up before he can go through with it. I like that new revelations occur in the final moments about things that we have only briefly learned about earlier on. I also like the way everything makes sense in those final moments, to the point where you realize exactly what Bridgette was doing the whole time, and how she went about it. The Last Seduction is a pretty good movie. I’m not entirely convinced whom the title refers to, although I suppose it is the last Seduction of one of the main characters who Bridgette uses and gets to do certain things. This movie is dark and comedic and has lots to like about it. The funny thing is that just about all of them only start coming up in the second half of the film. The setup is nearly an hour long, which is the lengthiest setup I have ever seen, but the payoff makes it all worthwhile. This is a pretty cool movie.